An estimated 10,000 school children will have their teeth protected against decay and cavities – for free – as part of a new dental sealant program. Teams from the Florida Department of Health in Broward County (DOH-Broward) are mobilizing to visit 103 elementary schools this school year, to apply the thin plastic coating to the teeth of children whose parents agree to the treatment. Numerous studies have shown that dental sealant can prevent cavities for years, especially on biting surfaces of molars where most decay happens. The project was sparked by a $1.27 million grant from the state Agency for Health Care Administration, operator of Florida Medicaid. In Palm Beach County, second graders already receive dental sealant from the Department at participating schools, along with fluoride rinses. (Information at (561) 840-4500. DOH-Broward has wanted to start the dental sealant pro-gram in schools for several years, Thaqi says, but had no way to make it happen until the state grant arrived. As many as six teams of dental hygienists with portable dental chairs will visit schools. All are classified as Title 1 schools, meaning that at least half of students come from low- to middle-income families who qualify for free or reduced-price lunches. Hygienists will give each child an oral health exam, a cleaning, fluoride rinse and a personal lesson in brushing and flossing. If appropriate, they will paint biting surfaces with the coating, which is tasteless, not visible and free of BPA (an additive some believe is harmful). The process is simple, pain-less and takes only minutes to complete. The teams will see an estimated 120 to 140 children a day and at least 10,000 by June, says DOH-Broward Dental Administrator Scott Glincher. Kids who need further dental care will be referred to their own dentists or to DOH-Broward’s free and low-cost dental clinics. 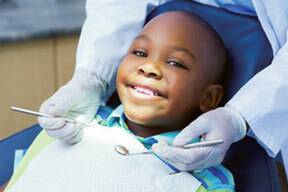 Not enough children receive dental sealants. The federal Centers for Disease Control and Prevention (CDC) and the American Dental Association urge all dentists to offer the protection in their offices, but say less than half do so. Uninsured kids have little access to sealants.